Fairhaven, MA – Bask, Inc. (Bask), a Registered Marijuana Dispensary in Fairhaven, MA, was recently nominated as the “Best Medical Dispensary” by the New England Cannabis Network (NECANN). The nomination comes as Bask prepares to celebrate its one-year anniversary of opening the doors to patients in Massachusetts and is finalizing applications to serve the Adult-use market. In February of 2018, Bask officially opened its doors to provide safe, laboratory tested cannabis to medical cannabis patients throughout Southeastern Massachusetts. The official opening was a huge milestone for Bask as the team went through a lengthy application process, including local permitting and approvals through the Fairhaven Board of Selectmen and the Planning Board. 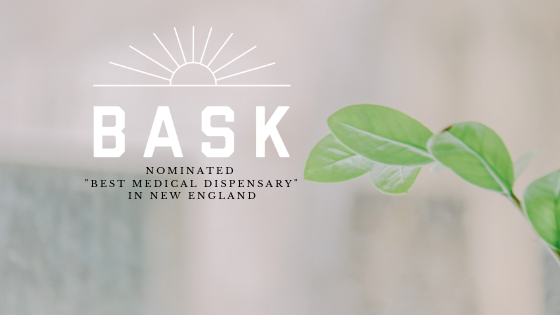 The Bask team is grateful for the nomination noting it is the only dispensary from Southeastern Massachusetts nominated for title of Best Medical Dispensary. “As a locally owned and operated business, to have Bask put the SouthCoast on the map, competing against dispensaries in Boston and Worcester, means a lot to our team and the support from our community” said Bask CEO, Chapman Dickerson. According to NECANN, the New England Cannabis Community Awards are designed to shine a spotlight and show appreciation for the cannabis community as a whole throughout New England. These awards offer a chance to recognize people and organizations who have made great contributions to the cannabis industry and communities throughout New England. The winners will be announced during the NECANN Conference March 22nd, at the Hynes Convention Center in Boston. Other organizations nominated for awards include Veterans Alternative Healing, which works with Bask to help Veterans reduce use of prescription opiates and provide access to safe and affordable cannabis. This partnership offers discount programs for Veterans with 100% service connected disabilities. Another organization, nominated for “Best New England Cannabis Non-Profit”, is Cannabis Community Care and Research Network (C3RN). Recently, Bask and C3RN teamed up with UMass Dartmouth to create a cannabis survey that was distributed to patients at Bask and other participating dispensaries in Massachusetts. “We’re very fortunate to have the opportunity to work closely with these organizations that share a common goal of providing adults with safe access to cannabis products and expanding cannabis research. I’m excited to see what 2019 will bring,” Ashley Payne, Marketing Manager at Bask. Now, a year after opening their doors to patients, the team is working towards opening their doors for recreational sales to adults 21 years and older. “We’re fortunate to have a great relationship with the town of Fairhaven and the SouthCoast and we look forward to expanding our service to responsible adults later this year,” explains Chapman Dickerson, CEO of Bask. Bask has received Priority Certification by the Cannabis Control Commission, which allows for expedited application processing for locations that are already operating as medical dispensaries. To speak with a member of the Bask team please call (774)305-4749 or email info@cometobask.com with any questions, comments or concerns about medical and adult-use/recreational cannabis. Visit www.cometobask.com for more information.